A one-of-a-kind franchise, a front office’s conservative approach, a roster caught in limbo, and the friction between the legendary quarterback and the embattled head coach. A closer examination of what has led to the Green Bay Packers’ most disappointing season of the past decade. Is he going to say it? It doesn’t feel like 2016, when they fell to 4-6 then ran the table, making it to the NFC championship. It doesn’t feel like 2014, when they were blown out in two of their first three games before flipping the switch, finishing 12-4 and coming within an onside kick recovery of the Super Bowl. As November turns into December, the Packers face the prospect of missing the playoffs with a healthy Rodgers for the first time since 2008—his first year as the starter. 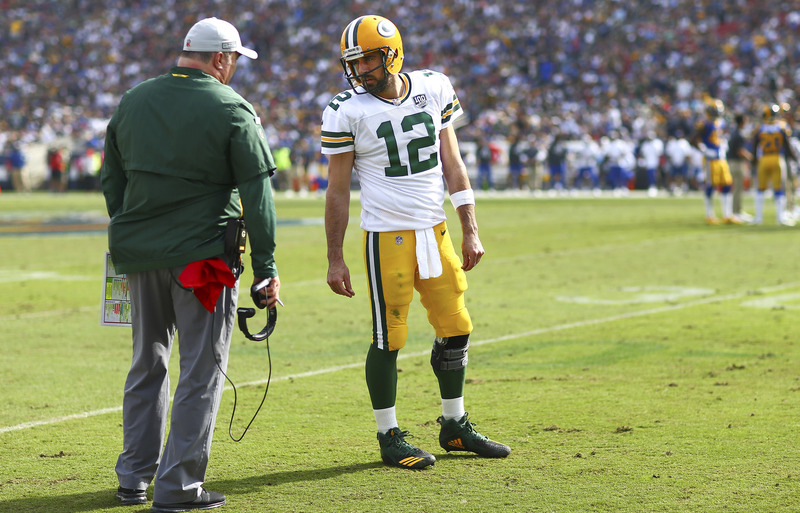 Observers can’t help but wonder: What is wrong with the Packers? It’s been nearly a year since Ted Thompson stepped down as general manager. But to understand what is happening in 2018, you must look back a few years. Many interviewed for this story say the Packers’ struggles can be traced back to Thompson’s final years as GM; others who won’t say it still suggest it with their actions. Thompson, of course, had a wildly successful overall run in Green Bay. He began his career as a front-office executive in Green Bay in 1992. After leaving for a five-year stint in Seattle, he returned to the Packers as general manager in 2005. The first selection of his first draft was Aaron Rodgers, and the team went to the postseason nine times in 13 seasons of Thompson’s GM tenure, including a Super Bowl XLV title. He will deservedly be inducted into the Packers Hall of Fame in May. Thompson was devoted to a strict draft-and-develop model, rarely signing free agents or making trades; it drove Green Bay’s success during most of his tenure. But the draft-and-develop model falls apart quickly if the team doesn’t draft well. For instance, of the Packers’ eight draft picks in 2015, just one remains on the roster, linebacker Jake Ryan (who is currently on injured reserve). Only wideout Davante Adams and center Corey Linsley remain from 2014’s nine-man class. But even as holes in the roster began to show the past few years, the Packers remained conservative in free agency. 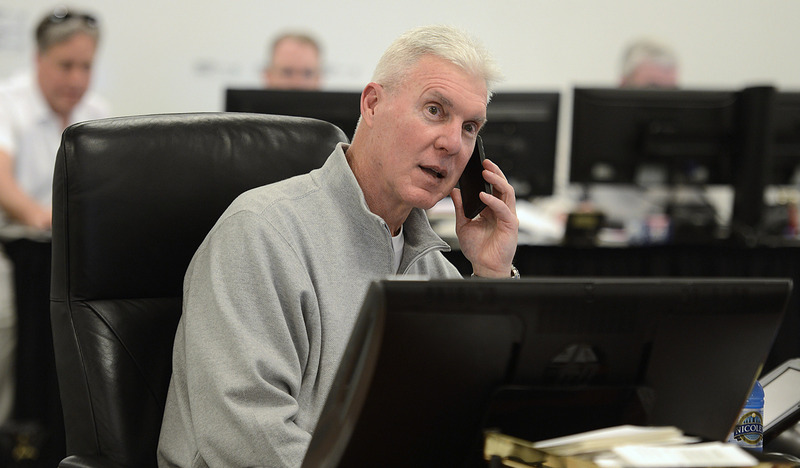 Ted Thompson, in the war room during the 2014 draft, served as Packers GM from 2005-17 and still consults with the team. Thompson had full autonomy over football operations. Team president Mark Murphy, who arrived in 2007, says he met with his GM regularly, but that he doesn’t involve himself in any football decisions. Some in the organization believed that because Green Bay has no actual owner (Murphy serves as a de facto owner), Thompson’s power went unchecked. The front office as a whole got too comfortable. And the conservative, traditional culture being created became stifling for some. Ron Wolf, the Hall of Fame GM who ran the Packers from 1991-2001, had a saying: Football is the most important thing. If we do the football part right, the result will be wins. It was a message about seeing the bigger picture, not sweating the small stuff, and taking care of the things that really mattered. Some in the organization felt like that message had been lost. Some of the team rules became byzantine. No backwards hats on the sidelines. No undershirts showing from underneath practice jerseys. All players must coordinate and wear the same color shoes, as determined by the team. When players leave the locker room for practice, the equipment staff tidies each locker, clearing it of any unsightly hangers or extra gear. Thompson set the rules, and it was up to Russ Ball, the VP of football administration/player finance who was seen as the only person in the building with Thompson’s full trust, to enforce them. One former Packer said that over time, these small rules add up and wear players down, causing some to question why certain things are the way they are. After Thompson stepped down, Murphy reorganized Green Bay’s power structure. During the interview process for a new general manager, Murphy decided Thompson’s job would be best be split into two separate roles. In January, director of player personnel Brian Gutekunst was promoted to general manager, and Ball was promoted to a new role, executive vice president/director of football operations. And Murphy made one more change: Instead of McCarthy and Ball reporting to the GM, they now, like Gutekunst, report directly to Murphy. Green Bay calls the triumvirate “football leadership,” creating natural checks and balances in the front office. 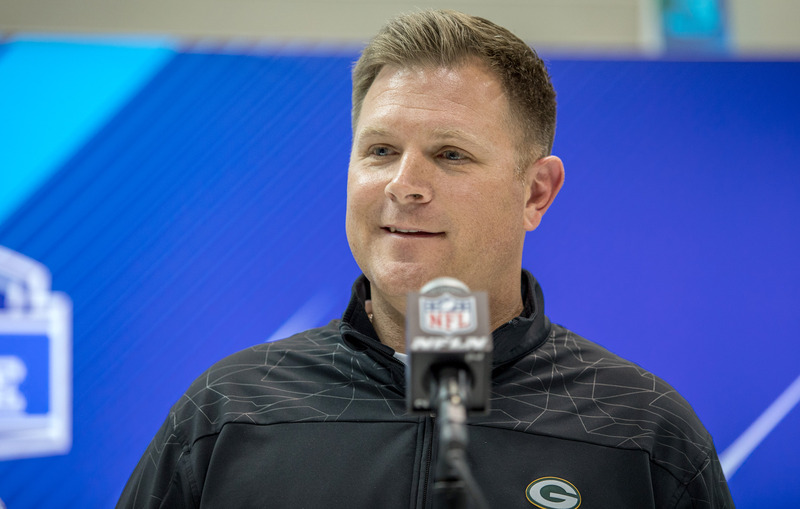 Brian Gutekunst joined the Packers in 2012 and was promoted to GM in January. Murphy denies any meaning the change in hierarchy might send about Thompson’s final seasons. He says 17 other NFL clubs have similar organizational structures—in which the head coach reports to the owners, not to the general manager. He says the Steelers are a club the Packers look to as a model, and in Pittsburgh, general manager Kevin Colbert and head coach Mike Tomlin both report to owner Art Rooney II. The early returns are promising from a roster-building standpoint. One scout for an NFC team said he thought the Packers rarely had a complete draft under Thompson, but Green Bay always had Rodgers, so it never hurt them the way it would a team without an elite quarterback. However, he thought that the 2018 draft, under Gutekunst, was especially strong from top to bottom. Thompson is still involved with the team, as a senior consultant, though he has moved back to his hometown in Texas. While Murphy is confident in the reorganization, multiple sources familiar with the inner workings of the franchise wonder if the Packers have created a new problem: too many cooks in the kitchen. Rodgers is the smartest guy in Green Bay’s locker room, football or otherwise. Every Friday, Packers quarterbacks, the offensive coordinator and the quarterbacks coach take a QB test. It’s typically 30 football questions and then 10-15 trivia questions, ranging from riddles to Sporcle-inspired random facts. It shouldn’t come as a surprise that Rodgers usually aces the test, which changes every week. The backups rotate putting the quiz together and try their best to stump Rodgers. “Aaron always knew about 90 percent of it,” says former Green Bay backup Joe Callahan. “He won a good amount.” Rodgers’s intelligence is one of his greatest strengths. It also makes coaching him a unique challenge. “I desperately want to be coached.” That’s what Rodgers told The MMQB on the eve of the 2015 season, when the Packers were seven months removed from a heartbreaking NFC title game loss in Seattle. (Through a spokesperson, the Packers declined an interview request for Rodgers.) The quarterback holds himself to impossibly high standards, and he holds his coaches to those same standards. He doesn’t forget any slight or grievance, no matter how small. He still brings up the fact that he was drafted 24th overall, the second quarterback after Alex Smith went No. 1 overall in the 2005 draft. Former Packers receiver Greg Jennings told Colin Cowherd in November that Rodgers would needle McCarthy about that. McCarthy, the year before he arrived in Green Bay, was the offensive coordinator in San Francisco, part of the regime that drafted Smith. McCarthy, like Rodgers, is an alpha male. When people familiar with the two were asked to describe their relationship, most say it is defined by tension. Until this year, it was a healthy tension that lifted both quarterback and coach. In 2018, something has been different. McCarthy is the play caller, but because Rodgers is so intelligent and such a good improvisational player, the quarterback has the green light to change plays on the field as he see fit. He does, so often that it can be hard for McCarthy to get into a rhythm as the play caller. McCarthy might call the same play three times in a game, without the play actually being run as he called it. And if McCarthy calls a play that Rodgers doesn’t like early in the game, that can sour the mood for the rest of the game. Several sources familiar with the inner workings of the organization say that it devolved into a competition over who can call the better play, and both want the credit when things go right. “Aaron won’t be upset this story is being written and some of these frustrations are getting out there,” says a source close to Rodgers. That mini-controversy was nothing compared to what CBS cameras captured during a victory over the Bengals last season. After taking a sack late in the third quarter, Rodgers looked to the sideline. It didn’t take an expert lip-reader to decipher his message. “Stupid f---ing call!” And then again for good measure. “Stupid f---ing call!” The following week, when Rodgers walked into his individual meeting with McCarthy, the head coach had the broadcast clip pulled up on the screen, ready to review and discuss. Early in Rodgers’s career, McCarthy spent a lot of time coaching him to better control his body language when he was frustrated. That day, they had something of a refresher course. When Monday Night Football set up at Lambeau Field for the Packers’ Week 6 game against the 49ers, the crew sat down with Rodgers and then McCarthy individually for production meetings the night before. Sideline analyst Booger McFarland, a straight shooter, leaned back in his chair and asked Rodgers about his relationship with McCarthy, and whether there were any issues between them. On Saturdays before games, McCarthy and Rodgers go over which plays Rodgers likes and wants to keep and which plays he wants cut from the game plan. 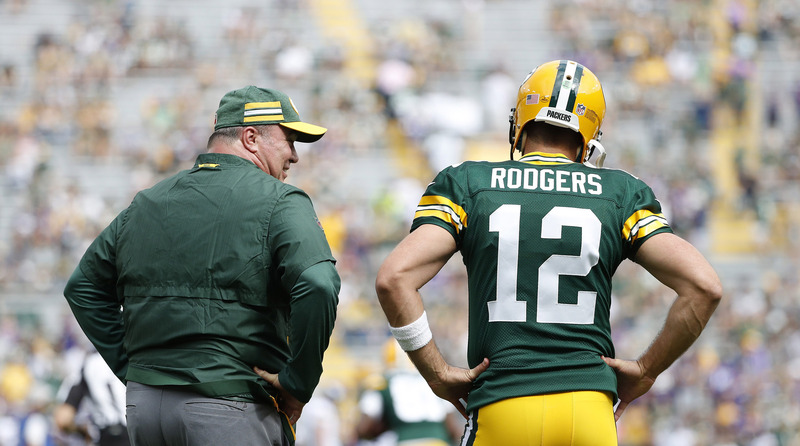 Though the two meet individually three to four times each week during the season, a source close to the quarterback says that, because McCarthy has other duties as the head coach, he misses several offensive install meetings or quarterback meetings, a source of frustration for Rodgers because McCarthy will add or change plays during the Saturday walkthroughs that mess with the established flow of the game plan. Because Rodgers has so much freedom, McCarthy’s frustration often comes from not knowing what check his quarterback went to and why. Kizer and Boyle have typically been in more conversations with Rodgers throughout the week, and sometimes explain his decisions to McCarthy in order to better set up future play calls. Early in the fourth quarter in Detroit this season, the Packers offense was running no huddle. Rodgers and Kizer had a few conversations on the sideline before the series about wanting to create matchup issues with Lions cornerback Darius Slay, bringing Adams inside, rather than lining him up outside. The QBs decided on a series of three playcalls focused on Adams, having him run crossers or sit down in the flat to eventually set up an out route that resulted in a red-zone touchdown. McCarthy wasn’t part of those conversations, so the quarterbacks explained that series to him afterward. McCarthy is coaching his 13th season in Green Bay, which ties him with New Orleans’ Sean Payton as the third-longest tenured of the 32 current NFL head coaches (behind New England’s Bill Belichick and Cincinnati’s Marvin Lewis). He survived the rocky transition from Favre to Rodgers. He’s taken the Packers to the playoffs nine times, including eight seasons in a row. He won a Super Bowl. Is it enough to save his job if the Packers miss the playoffs for the second season in a row? Nearly every source who participated in this story agreed: McCarthy's time in Green Bay has probably run its course. Several sources familiar with the inner workings of the organization say that McCarthy hasn’t done much to keep things fresh and change things up from season to season, other than making changes to the practice schedule based on player input. McCarthy has tried some unconventional ideas occasionally, but they usually don’t stick. For instance, one former player recalls the year in OTAs when, after a season in which the Packers didn’t force many turnovers, McCarthy tested out a new drill where all 11 guys on defense had to touch the ball and take a chop at the ball carrier on each play. This quickly turned into madness—the ball carrier was held up at the line of scrimmage until every guy took his shot, or defensive linemen ran 70 yards downfield to get their shot. McCarthy meets with every player on the roster for an exit interview before they head home in June, but one source close to organization says most players don’t feel comfortable going to McCarthy with problems during the season and instead wait until the exit interview—even if it’s early in the season and a potential season-long the issue could be resolved. A Packers spokesperson denies that McCarthy’s door is closed to players, and adds that for anyone who isn’t comfortable going to McCarthy, the Packers have a players’ council made up of a representative from each position group that meets with the director of player development and can take things up the chain. McCarthy was never particularly close with players, but sources close to the organization say that as the culture grew more uptight in Green Bay under Thompson, McCarthy became more closed off to players. Van Pelt has a history with McCarthy; he was a quarterback at University of Pittsburgh when McCarthy was a grad assistant working with the QBs (1989-91). Van Pelt spent six years on McCarthy’s Green Bay staff, the last four as QBs coach, and he and Rodgers grew close. Rodgers would often go over to Van Pelt’s house for dinners with the Van Pelt family, the coach’s wife and three kids. Van Pelt (who declined an interview request for this story) turned down a contract extension from the Packers after the 2016 season, wanting to keep his options open in hopes of landing a coordinator job (NFL teams can block position coaches under contract from interviewing elsewhere). With Rodgers injured for most of 2017 and backup Brett Hundley unprepared to step in, the Packers had a down year and Van Pelt didn’t land a coordinator job. McCarthy chose to go in a different direction, hiring Cignetti, the Giants QBs coach the past two years, to the same position. One source close to Rodgers says the quarterback’s relationship with Cignetti is nowhere near as close as it was with Van Pelt, who is now QBs coach for the Cincinnati Bengals. When asked why they think Van Pelt is no longer in Green Bay, several sources close to the team say they believe, because Van Pelt had Rodgers’s ear, McCarthy saw him as a threat. The MMQB’s Andy Benoit made the point earlier this week: Criticism of McCarthy’s offense as stale no longer holds true. The Packers offense has evolved in 2018, moving away from the spread formations and isolation routes that defined the system for years. In November, the Packers lined up in spread formations about half as often as they did in September, and condensed looks (a la Sean McVay’s Rams offense, with receivers aligned tight to the formation) about three times as often as they did during the first month of the season. Those condensed formations lead to more naturally intertwined route combinations, create more traffic for defenders to work through, present more space to which receivers can run their routes, and put receivers in better position to block on run plays. 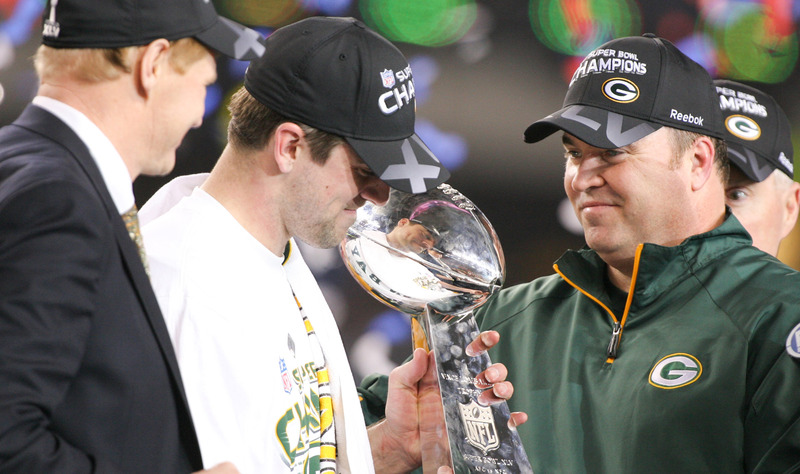 Rodgers and McCarthy captured the Lombardi Trophy in Rodgers' third season as a starter. The spread system played into Rodgers’s strengths as a sandlot playmaker. But that style of play requires tremendous chemistry between the quarterback and the other 10 players, who must have a similar “feel” for how any given play is developing and what their quarterback will do on the fly. The roster turnover made that nearly impossible to pull off in 2018. Jordy Nelson, long Rodgers’s favorite target, was released in March, while Randall Cobb, the longest-tenured Packers receiver, has missed half this season with a hamstring injury and third-year receiver Geronimo Allison lasted just five games before going on injured reserve with a groin injury. Rookies Marquez Valdes-Scantling and Equanimeous St. Brown have been asked to take on significant roles alongside Adams and first-year Packer Jimmy Graham. Valdes-Scantling and St. Brown are too green to keep up with Rodgers’s improvisational style, making a more highly schemed system a necessity. Though, judging from how the offense has struggled to find its footing at times, the change might have been forced upon Rodgers and Co. before they were ready. The defense has battled injuries and inexperience as well. Gutekunst’s big free-agent signing on that side of the ball, defensive lineman Muhammad Wilkerson, is out for the season with an ankle injury. The first-year GM was aggressive at the trade deadline, but it was to gather future assets rather than find immediate help. Along with sending struggling running back Ty Montgomery to the Ravens just days after his costly kick return fumble against the Rams, Gutekunst dealt fifth-year safety Ha Ha Clinton-Dix, an impending free agent who had played every snap for a secondary relying on first- and second-year players, to Washington for a draft pick. The Clinton-Dix trade sent mixed signals to the locker room, as it was seemingly a rebuilding move (though one that guaranteed Green Bay an extra pick in the 2019 draft, rather than waiting for a compensation pick that might not come in 2020 if they are aggressive in free agency this winter). Lately, the cornerbacking group has been ravaged by injuries, putting first-year defensive coordinator Mike Pettine, who prefers an aggressive man-to-man defense, in a bind. It has also been a season of near-misses. A September meeting with the Vikings ended in a tie in part because of a controversial roughing the passer penalty on Clay Matthews, one that wouldn’t have been called had it happened after September. Veteran kicker Mason Crosby missed four field goals and an extra point—indoors—in a upset loss in Detroit. A potential comeback at Washington was foiled by another questionable roughing flag on Matthews. Back-to-back road losses to the Rams and Patriots turned on ill-timed fumbles. And head coach Mike McCarthy’s overly conservative decision to punt on a fourth-and-2 late in Seattle cost them a chance to win despite a defense plagued by injuries at all three levels, and a scheduling glitch that required them to travel two time zones and play a game on three days’ rest. The “big play to Davante” Taylor is referring to is Rodgers’s perfect, tight-window throw to Adams, a 20-yard touchdown to give Green Bay the lead for good on that Monday night in Philly. It’s not just that the team’s play has been choppy; the galvanizing moment that sparks a big run simply hasn’t happened. SI VAULT: ‘Green and Golden.’ The SI cover story from Green Bay’s Super Bowl XLV victory. Reporters at Minnesota’s U.S. Bank Stadium are still prodding, trying to draw the right words out of Rodgers. They ask the same question again and again, each time with a slightly different twist, each one a transparent attempt to goad him into giving a passionate defense of his team, just like he’s done when the Packers have been in similarly precarious positions in the past. Do you think the playoffs are still realistic? You’ve been trying to find that galvanizing moment for this team. Are you worried that moment might not come and if it comes, it might be too late? 9-6-1. That gets you in? What’s the feeling been like this season? It seems like the playoffs are a reach right now. He held his last pause a beat longer than the rest, as a familiar glint flashed in his eyes, a hint of a smile visible underneath his beard. But it was gone as quickly as it came. There is nothing more Aaron Rodgers can say.